In late March, I posted this preview of the 2009 Michigan football team. At the time, I could conceive of no way, absent injuries to key players like Clausen and Floyd, that Michigan would beat Notre Dame in this early season matchup. However, Michigan looked better in Week 1 than I expected. What follows is first Michael's overview of new defensive coordinator Greg Robinson and his schemes, then my refresher on the Michigan starting units and a brief closing. Greg Robinson. The former head coach at Syracuse is now in charge of the Wolverine defense, making this the fourth time in four head coaching stints that Rich Rodriguez replaced defensive coordinators. Despite a rough time in upstate New York, Robinson will be firmly in charge of the Michigan defense, and they had a nice start last weekend. When Robinson took over the Orangemen in 2005, he was known for running a 4-3 under defense, which we talked about at the time. Since then, it appears his defense has evolved into a more multiple front defense that incorporates both even and odd fronts through the use of a hybrid defensive end. And this is exactly what head man Rich Rodriguez wanted, a "pro 3-4" that utilizes odd man fronts. "We're going to be less experienced," Rodriguez said. "Even though it's a different system defensively (under Greg Robinson), a lot of the same methods and fundamentals the position coaches were teaching and now have the second year to take hold. "We're probably more to a pro 3-4 than a 4-3 ... There's some 4-3 stuff in there. Then you have your nickel and dime and third-down packages that are three-man fronts. We're all over the place, but just about every defense in the country does that." One of Robinson's first moves was to slide Stevie Brown from safety to the Sam backer spot. There was initially some confusion in the media about this being a special hybrid position, but that was recently cleared up. However, the one hybrid position that Robinson will bring to the Wolverines is a Quick (end), a hybrid linebacker/defensive end who can line up anywhere along the line of scrimmage in an attempt to confuse and disrupt protection schemes. This is nothing new to those who have coached against Robinson, as his Syracuse defenses used the same hybrid player, also called the Spinner, at least as far back as 2006. One also has to wonder if, given the coaching connection between Robinson and Pete Carroll, the Spinner or whatever it's called is similar to the Trojans' Elephant position that was manned by Brian Cushing in 2006. So despite some initial confusion and smokescreen, it seems likely to be the same defensive scheme that Robinson has always run. The same scheme that Weis saw in the NFL and twice over the last four years. The same scheme he beat four out of the first five times he faced it. Then again, it's also the same scheme that held Irish running backs to 52 yards on 23 carries last year as the Orangemen came back from a 13-point deficit to stun the Irish at home. If Michigan can recruit better defensive talent, Robinson should thrive because he is known as one of the smartest and most passionate defensive coordinators in football. He is renowned for his playcalling and firing up players in the lockerroom. Robinson stymied the Irish offense last year with what little talent he possessed on the Syracuse roster. Will he be able to do the same in Ann Arbor and with a defense seeking vindication after a poor 2008? Western Michigan or not, that was fast. RB: Carlos Brown/Brandon Minor. Minor is listed as "probable" for the game with an ankle injury, and Brown will likely start. When checking on Minor's status, I learned that college fantasy football exists. Do Rick Reilly a/or Mitch Albom know about this? Look for a "how can people play college fantasy football in the middle of a credit crisis" article at newstands near you. Brown played well against WMU, gaining 54 yards in ten carries. Kevin Grady, Michael Shaw, and both QBs will also supplement the Wolverine rushing attack. WR/TE: Junior Hemingway had a magnificent afternoon against the Broncos, with 103 yards, two touchdowns, and a 44-yard reception. Hemingway is now listed as "doubtful" for the ND game, with a sprained ankle. Instead, Greg Mathews, TE Kevin Koger, and Martavious Odoms will likely lead the Michigan receivers. OL: The line played well, paving the way for 4.8 net yards per rush and allowing no sacks. Ortmann, Schilling, Molk, Moosman, and Huyge return for week 2. DL: Brandon Graham, Ryan Van Bergen, Mike Martin, and Freshman Craig Roh all had nice games against WMU. Every year, Michigan seems to overachieve along the defensive lines. I realize this is a different era in Ann Arbor in nearly every respect, but good defensive line play may be one constant. When Michigan has beaten ND -- most notably, in 2006 -- the DL was the foundation. Paul Duncan and his mates must be ready for these guys. All of Notre Dame's advantages against the Michigan secondary could be undermined or negated if ND cannot run and cannot protect Jimmy Clausen. We saw a much better offensive line against Nevada than we did against Syracuse and USC. We will need to see even more improvement in Week 2. LB: Obi Ezeh led the way for Michigan, with 8 tackles, a pass breakup, and a forced fumble. Jonas Mouton had six tackles of his own, and he will be motivated to avenge a frustrating performance against ND last season. Stevie Brown -- despite the choice of first name, he is eligible to vote and drive a car -- seems to be a better fit at linebacker than he was in the secondary. 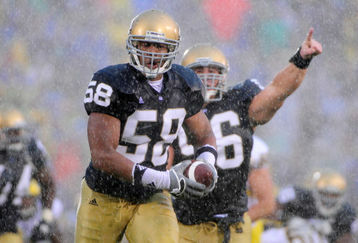 He also had six tackles against the Broncos, and he will be one of the captains for the ND game. While Ezeh must be accounted for, I am not as concerned about the linebackers as I am about the defensive line. DB: Boubacar Cissoko was banged up in Week 1, but should be ready for the ND game. Overall, this unit held up pretty well against accomplished WMU quarterback Tim Hiller. As with the ND-Nevada matchup, the Wolverine defense outperformed expectations. Hiller was limited to 259 yards and one touchdown. Michigan picked him off twice, demonstrating considerable improvement from last season. Overall, Michigan is still thin in key spots, especially the secondary. They have more uncertainty (but possibly better depth) at running back than in March. Their true Freshman QB is still a true Freshman QB, but he's better than I thought he would be. Both lines looked good. The linebackers looked good. Notre Dame will need to play well to win this game. They certainly should not lack motivation. No player on the Irish roster has played a more important game. Both teams have everything to prove and everything to lose. Michigan appears more cohesive than last year and invigorated by allegations that their coach is a hillbilly cheater. Notre Dame is beginning to receive the always coveted "respect." Now they must earn it. They beat Hawaii and Nevada, and both games were a lot of fun. Not this week. If Yost hadn't taken his ball and gone home, perhaps we would now be in the Big Ten, and our idea of football excellence would entail two or three losses per year and a trip to the Rose Bowl twice a decade. But instead, you blackballed us, and tried to choke us out of existence. You should have finished the job. Envy Notre Dame's players on Saturday: only inches and seconds stand between them and their next opportunity to inflict pain on Michigan and earn victory against a vile opponent. Notre Dame can win this game. Notre Dame must win this game. Notre Dame will win this game.